As promised here are some photos of the better side of Lee Marvin Beach. 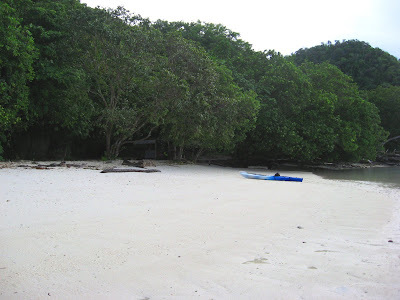 It makes a nice destination on a days kayaking outing if you are staying in Koror. The beach pictured is at low tide. The film "Hell in the Pacific" was made here starring Lee Marvin and Toshiro Mifune. 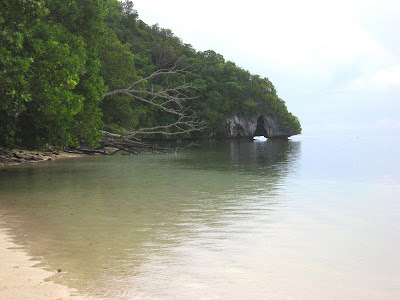 On Palau people always ask how you, the visitor, heard about Palau. For me it was that I read about the film being made and how Lee Marvin had purchased his own Pacific island (like Marlon Brando) in Palau. I remember searching for it on a map. 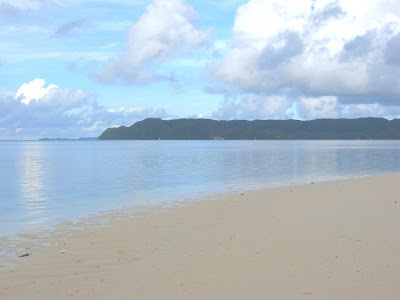 Margie's Beach is located on the other side of the island that you see in the distance.